Readers enter Jump Codes, printed in display ads, on your newspaper's Web site to get special discounts, respond to special promotions, and see additional information on the advertiser's products, on the Internet. 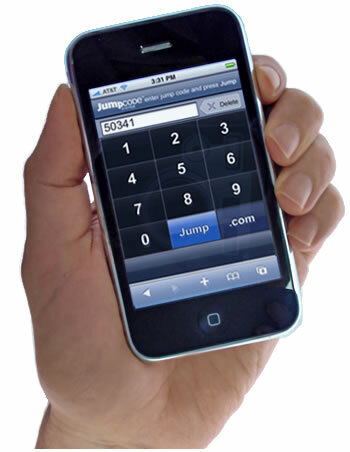 Jump Codes expand the reach of print advertising by giving prospective customers the information they need in order to make purchasing decisions, the promotions to help them make that purchasing decision faster, and the means to buy instantly, online. The Jump Code system gives your display advertising team a useful and profitable new business service which can be offered as a value-added cost option to your newspaper's display advertisers. 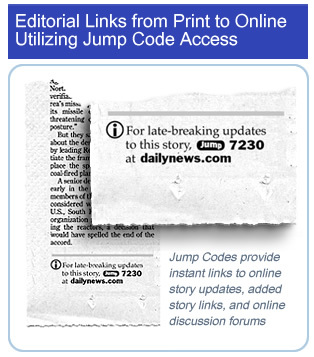 The Jump Code System opens up a whole new range of interactivity between your print publication and your newspaper's companion Web site, giving your readers instant access to your paper's most up-to-date Web news coverage, supplemental information, and third-party links referenced in your newspaper's print editorial content. Jump Codes linking your print content to the Web combine the best qualities of print and the Internet by merging the familiarity and convenience of print with the instant access and speed of the Internet. By using Jump Codes to link your print newspaper more closely to the Internet, you further insure the value, usefulness, and profitability of your newspaper in the online era, building new value-added revenue opportunities for your newspaper operations. We can develop a solution implemented for your advertising sales and editorial departments, and for your electronic publishing and production systems. Please contact us for more information.